Food poisoning is no picnic for sufferers, but are we doing all we can to prevent our friends and family members from getting sick? A new report from the nonprofit science organization NSF International suggests prevention starts with keeping your kitchen clean. Scientists analyzed common surfaces and appliances in our kitchens, and found an assortment of bacteria including major causes of foodborne illness including E. coli, salmonella and listeria monocytogenes. "They were all a little bit surprising," Lisa Yakas, a microbiologist and senior project manager at NSF, told CBSNews.com of the germiest kitchen items her study found. Each year, one in six Americans -- or 48 million people -- get sick from a foodborne illness resulting in 128,000 hospitalizations and 3,000 deaths, according to the Centers for Disease Control and Prevention. NSF international took up the challenge of finding the germiest spots in the kitchen as a follow-up to its 2011 study that looked at the most bacteria-ridden areas of our homes. 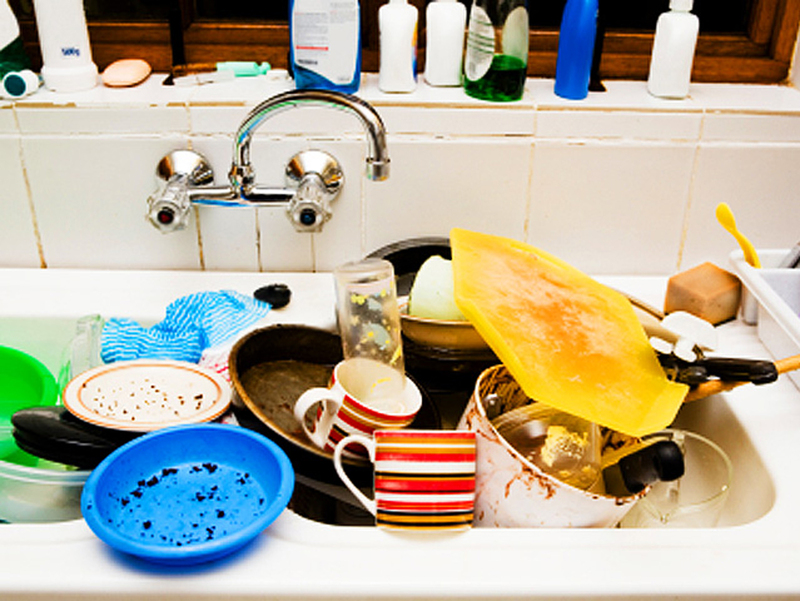 That study found dish sponges and rags were the germiest items, followed by kitchen sinks, toothbrush holders, pet bowls and coffee makers. For the new study, NSF enlisted 20 volunteer families to swab 14 common kitchen items: the blender, can opener, flatware storage tray, food storage containers with rubber seals, knife block, microwave keypad, pizza cutter, spatula, strainer and the refrigerator ice dispenser, water dispenser and meat and vegetable compartments. The NSF analysis was looking for four types of microorganisms linked to fooborne illness: E. coli, salmonella, yeast and mold, and listeria. The presence of these items in the kitchen is considered a health risk, according to NSF, especially for those most susceptible to foodborne illness including pregnant women, older adults and people with a weakened immune system. What the swabs showed may gave you pause next time you're preparing dinner. Twenty-five percent of items tested contained E. coli bacteria, including the refrigerator meat compartment, rubber spatula, blender gasket, can opener and pizza cutter. E. coli bacteria can spread through contaminated food and water, causing diarrhea, urinary tract infections, pneumonia and other complications that can damage blood cells and kidneys. Salmonella was found on 25 percent of items tested, including the meat and vegetable compartments in the refrigerator, spatula, blender, gasket, refrigerator ice and water dispensers and the rubber seals on food storage containers. Salmonella bacteria can cause the infection salmonellosis, a disease that can cause diarrhea, fever, stomach pain or more severe complications in at risk groups including the elderly, very young and people with weakened immune systems. Yeast and mold was found on 100 percent of all 14 items. Six items had especially concerning levels of mold, including the refrigerator vegetable compartment, spatula, blender gasket, refrigerator ice and water dispensers and the rubber seal on a food storage container.These contaminants can enter your food and speed up spoilage, or lead to allergic reactions for some people. Listeria was found on 10 percent of all items tested, including the refrigerator vegetable compartment and refrigerator door seal. Listeria monocytogenes bacteria can cause fever, muscle aches and gastrointestinal symptoms. In 2011, a listeria outbreak caused by cantaloupes sickened 147 people in 28 states, causing 33 deaths and one miscarriage. In no particular order, the six "germiest" items in the kitchen were the refrigerator vegetable and meat compartments, blender gasket, can opener, rubber spatula and rubber-sealed food storage container. These items come in direct contact with food, especially raw produce, meats and ready-to-eat meals, potentially making friends and family sick. That's why NSF urges proper cleaning of all of these kitchen items. For example, Yakas pointed out that many people may not realize they need to disassemble the entire blender, removing the gasket and the rubber seal before cleaning. That's where a lot of the bacteria was found. "I think the biggest oversight that people make is they don't follow the manufacturer's instructions when it comes to cleaning," said Yakas. "They just don't think these places can be dirty."